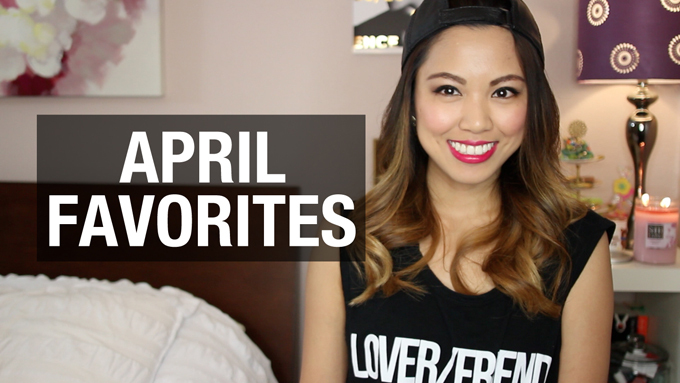 With April being said and done, here's a wrap-up of my favorite things for the month of April. Read more or watch the video after the jump! • Marc Jacobs Honey Fragrance - My brother got me the fragrance set for Christmas since it's been on my wishlist when it first came out. However, I've only started using this recently since I was still hooked on my Chloe perfume (which has become my signature scent now amongst the people I know). Even though my Chloe has been my everyday scent for at least two years now, I wanted to switch things up a little bit by rotating it with the MJ Honey perfume. The MJ Honey has a much lighter, subtle scent and a little bit sweeter compared to my Chloe. It's the perfect scent for spring and summer as the sweetness of it is more on the fruity side. Even the bottle itself is very appropriate and could pretty much describe what you'd expect from the perfume. The scent only lasts for the majority of the day, and it doesn't have a lasting power compared to my Chloe perfume which can carry on until the next day. But if you're looking for a sweet, light, and clean smell, this might be the perfume for you. • Lancome Vernis in Love in Simply Aqua and Plunge Pool - I recently just got these colors from the Vanity Fair event that I previously attended that had a mani station. Unfortunately, I believe these colors are no longer available. I did some research (Googling) to find out the name of the polishes and it seems like they were from a 2013 Lancome Collection: Aquatic Summer. I've been really loving these colors lately since they make the perfect spring and summer color. The Simply Aqua nail polish is the perfect powder blue that just brighten the look of hands. Plunge Pool nail polish is the cobalt blue nail polish that I've been looking for. I had some difficulty in applying Simply Aqua and found the formula a little streaky while Plunge Pool applied like a dream. 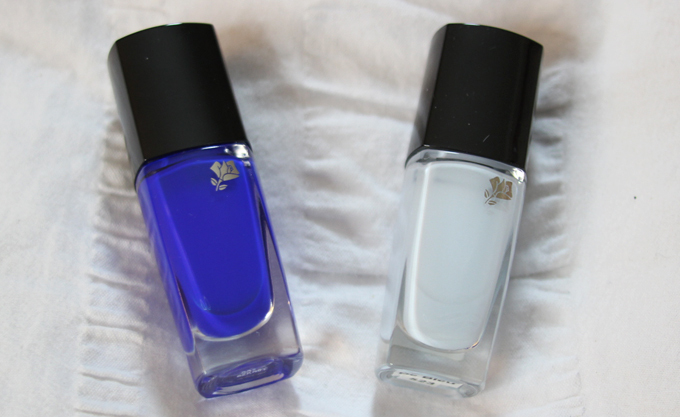 Both nail polishes have a glossy finish and lasts at least a week before any crazy chipping. The nail polish brush also made it easier to apply as the shape of the brush gives you a little bit more control and precision in your application. 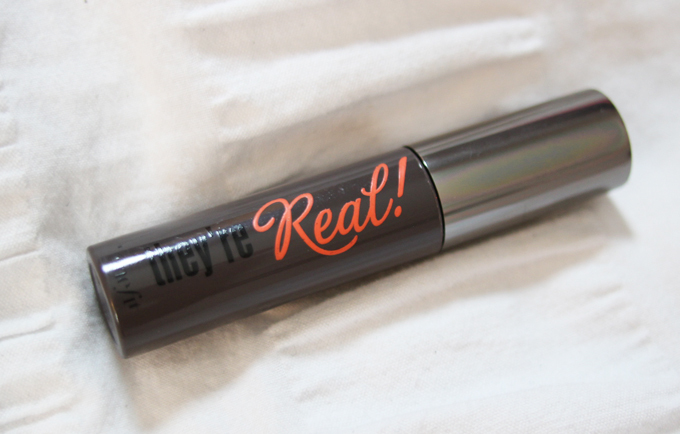 • Benefit They're Real Mascara - I've realized that mascaras get better as you use it. I wasn't a big fan of this mascara in the beginning since I prefer a more natural brush wand as opposed to a synthetic one. I also found that the tip of the brush was a little bit too prickly for me. I almost dismissed on using this mascara, but my subconscious kept leaving this mascara in my makeup bag as my only mascara (which really left me no choice than to use whatever I have in my makeup bag when I'm running late). Eventually, I found myself just reaching out for this more and loving it. The synthetic brush actually combs through my lashes nicely to help lengthen and add volume to my lashes. I just love how my lashes end up looking with this mascara that sometimes I can forgo the eyeliner because the mascara is enough to get me out of the "you look tired/sick" look. 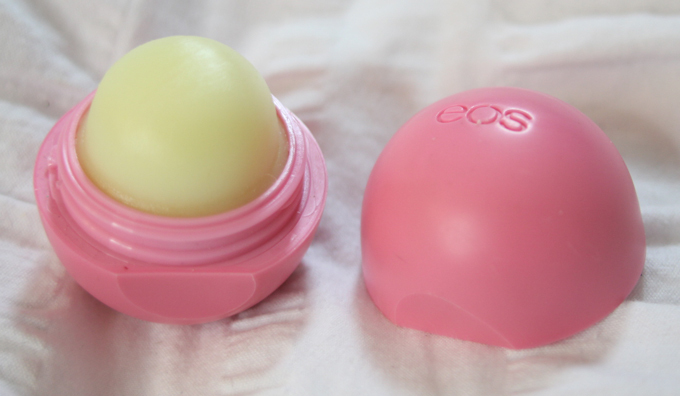 • EOS Lipbalm in Strawberry Sorbet - Ok, back in 2008 I wrote a post about being allergic to Chapstick. Ever since then, I've pretty much swore off any wax balms because of the fear that my lips might balloon again. I've always used Chapstick before, but for some reason in 2008 my body just went "oh no you din't" on me. This is why I'm a little bit late on the EOS lipbalm bandwagon. Even though I thought that the packaging was cute and interesting, I never really bothered getting one because it can be a potential allergic reaction. But I guess I was feeling pretty brave and adventurous the day I finally bought one. This product sat for months in my drawer which made me wonder why I even bought it. Until one day, I lost my Rosebud Salve lip balm. Going to Sephora was not an option, so I finally decided to open this one up. Thankfully, no allergic reaction after constant use of this lipbalm, so I've been really enjoying it. It does the job of keeping my lips hydrated, and it also tastes delicious. And can we talk about how cute the packaging is? • The Body Shop Grapefruit Scrub - On my last favorites video (February Favorites), I talked about how much I love (and still do) the Body Shop Grapefruit body butter. I briefly mentioned the scrub also in the video, but it came in as a full-on favorite these past two months. 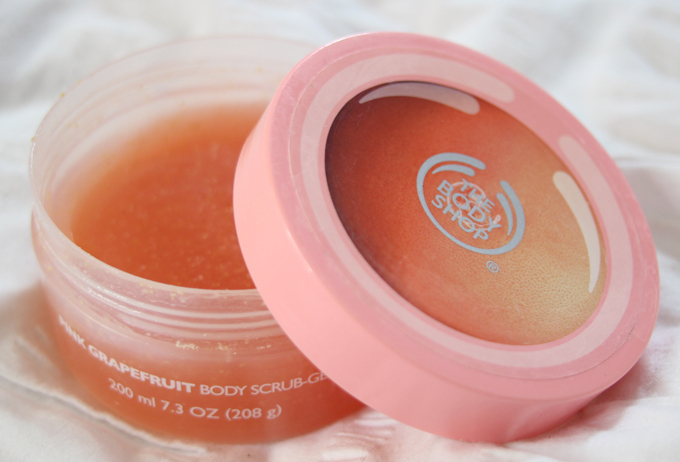 This scrub does a good job of exfoliating and leaving my skin smooth and smelling so fruity. The scrub is itself is gentle, but it still gets the job done. It doesn't feel like you're rubbing gravel into your body. • Jerome Dreyfuss Twee bag - My new go to bag this month! It's small, edgy, and it has numerous holes on the strap so you can adjust it however long you want. I'll have a more detailed review on this bag soon. But for now, just enjoy how it looks like. • Nutribullet - In the beginning of April, I challenged myself to adapt healthier lifestyle. I've been blessed for years with some great metabolism, but lez be honest, I'm not always going to have that. In fact, it's slowly starting to show. I'm not really a fan of salads, but I figured that I need to start eating more veggies as a first step considering how bad I eat especially on weekends (what can I say, I really like to eat). I figured that I should be at least eating healthy five days out of the week. I've been using my Nutribullet every morning to start off my day as my breakfast. Prior to owning a Nutribullet, I almost always skip breakfast and will not eat anything until lunch time. Every morning, I just make some variation of the "green smoothie" by throwing in some leafy greens, water or coconut milk, and a mixture of fruits. I like how convenient and easy it is to make my smoothie with the Nutribullet even though I'm pressed for time in the morning. I just throw everything in the tumbler and then carry and drink off the same tumbler. I've noticed a difference having my smoothie/juice in the morning ever since I started doing it. I became more alert,less tired, and less burnt out after lunch. I just have more energy in general which helps in my productivity. It's also just great knowing that I'm eating more fruits and vegetables than I used to. 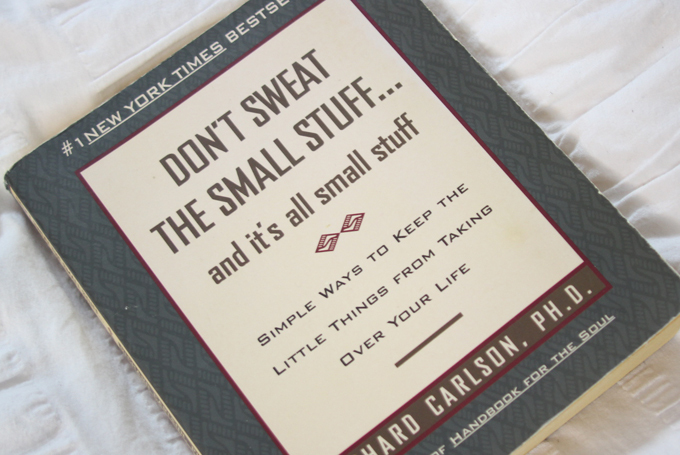 • "Don't Sweat the Small Stuff" by Richard Carlson - For the month April, I've been doing plenty of 'soul searching." Sometimes, there just comes a time when you just sit there and reevaluate your life. I've had this book for while and I've tried reading it, but this month was the first month were I really sat down and just absorb everything in this book. It's a very easy read and it really helps put things into perspective. I've been applying what I learned from the book by making small changes such as not to letting the little things in life that would usually drive me crazy (i.e. getting upset over slow drivers). The book is only as good if you apply it. It also reminds you to live in a more present moment (which we tend to forget sometimes) to help improve the overall quality of your life. I've been enjoying and learning a lot from this book. Some of the things written are pretty obvious, but sometimes we just need a little reminder. And that's all folks. I hope you enjoyed the video and the write-up. Let me know on the comments below what you've been loving lately! I'm always on the look out for new things to try! 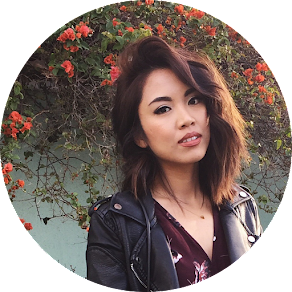 Your BEAUTY FAVORITES is Awesome, I love this blog.